The recent documentary film Slingshot, about Dean Kamen’s quest to deliver water purification systems to the billion of us who need them, touches only briefly on the invention for which Kamen is most widely recognized: Segway. Almost everyone’s heard of the self-balancing electric scooter, though far fewer can name its inventor. Despite Segway’s fame, conventional wisdom says it was a failure: an overhyped product that solved no important problem. At one point in the film we see Kamen gliding around his property in New Hampshire, reflecting on the unsustainability of a civilization whose organizing structural principle has been the automobile. Looking back over my recent blog posts I can see it’s a topic that’s been much on my mind. This picture illustrates two very different options available to me when traveling between our home (1) in Santa Rosa’s West End and Luann’s studio (6) in the SOFA arts district downtown. 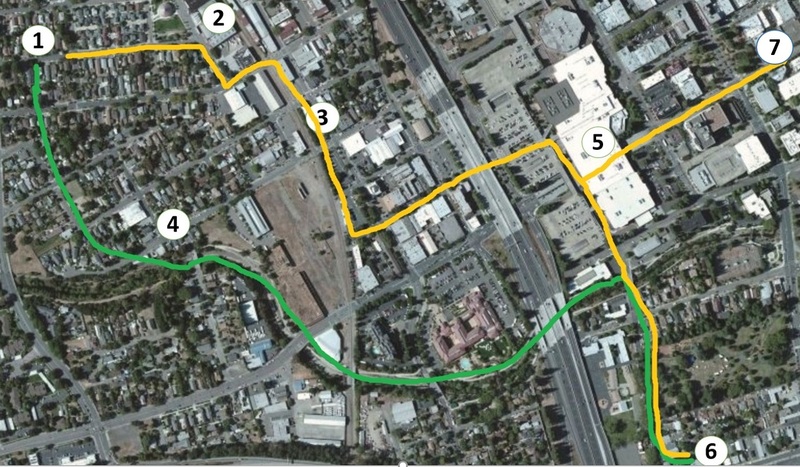 The yellow path traverses two structures that bisect the town: the 101 freeway and the Santa Rosa Plaza, our downtown mall. It’s a walkable journey — with difficulty — but not a cyclable one as the path of least resistance runs through the interior of the mall. You won’t enjoy the walk, though. It entails long periods of waiting at stop lights to cross roads that, depending on time of day, may carry much or very little vehicular traffic. The green path, meanwhile, runs along the Prince Memorial Greenway. Begun in 1989, not long after the mall was built, the greenway both restored the ecologically damaged Santa Rosa Creek and opened up an ideal route for walking, cycling, and — though I’ve yet to see it there — Segwaying. Some say that Segway was never destined to coexist with automobile-based infrastructure. It could only succeed in yet-to-be-built cities defined by an alternative pattern language that describes RING ROADS, LOCAL TRANSPORT AREAS, and PEDESTRIAN PATHS. That might be true. But while some of the 300 million Chinese expected to urbanize by 2030 [Forbes] may land in such cities, most of us inhabit legacy infrastructure that allocates large amounts of urban space to the temporary storage of automobiles, and equally large amounts to their roadways. The pervasive fabric of concrete and pavement feels permanent, unchangeable. And yet I traverse it easily. Last month, walking along the creek within view of the 101 freeway, I saw a merlin taking a bath. Neither of us was bothered by traffic noise, the sonic barriers around the freeway at that point are highly effective. 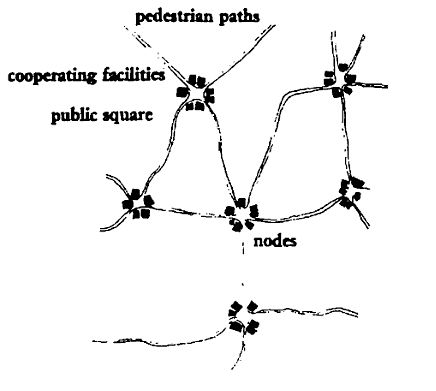 What would it take to weave more of these corridors into our cities and flow non-automotive traffic through them? Stymied by that question, Dean Kamen asked a different one: What would it take to deliver reliable high-capacity low-power vapor compression distillers to the people who need them? Actually inventing and refining a reliable high-capacity low-power vapor compression distiller is necessary but not sufficient. You need to distribute that gear worldwide and support its ongoing use. Governments lack the expertise and capacity to do that. The Coca-Cola company not only has both but also, it turns out, a mandate to offset the water impact of its business. The effort to purify the world’s water is now a Coke / DEKA partnership. It has been a long road for Slingshot but thanks to that partnership I now think Kamen’s vision for clean water can be realized in my lifetime. I’m less optimistic about living to see the realization of his vision for humane modes of local transportation. But I’m willing to be surprised. And I wonder what unsuspected distribution partner might help bring the change. Author Jon UdellPosted on 3 Jan 2016 3 Jan 2016 Categories . One could say the same about the horse. Over the last hundred years or so, we’ve solved the horse problem. At this point, I don’t see the automobile as a problem. It takes us where we want to go when we want to go and lets us live in single family detached housing as many of us like. Cars are great for trips that involve significant distance and/or cargo and aren’t doable with public transit. Lacking Zipcar-like services, which are unavailable in the smaller cities we’ve chosen, I wouldn’t do without one. But as the world continues to urbanize, I hope we can reconfigure our urban cores in ways that better accommodate detached housing along with a more diverse mix of cars and lighter vehicles and modes.